In stock -This product will ship today if ordered within the next 9 hours and 7 minutes. 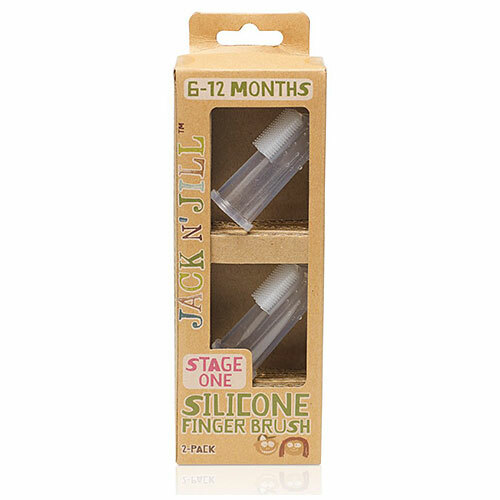 The Jack N` Jill silicone finger brush is a safe, hygienic way to clean your baby`s first teeth. Made from 100% medical/food grade silicone, this has been designed for a comfortable and effective start towards good oral hygiene. Easy to use, gentle on gums, non-toxic and BPA free. For babies aged 6-12 months. Wash your hands and the finger brush before each use! Gently brush teeth with circular motion. Suitable from first tooth! Chill in fridge to help relieve teething discomfort. Sterilise often. Only to be used by an adult on baby/toddler. Do not allow child to hold. This is not a pacifier. Not for sucking or chewing. Below are reviews of Jack N` Jill Silicone Finger Brush 2 Pack by bodykind customers. If you have tried this product we'd love to hear what you think so please leave a review. My baby loves this brush and opens her mouth for me to brush, it’s soft and chewy! 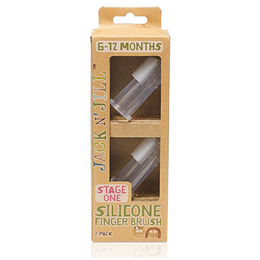 The Jack N` Jill silicone finger brush is a safe, hygienic way to clean your baby`s first teeth. Made from 100% medical/food grade silicone, this has been designed for a comfortable and effective start towards good oral hygiene.